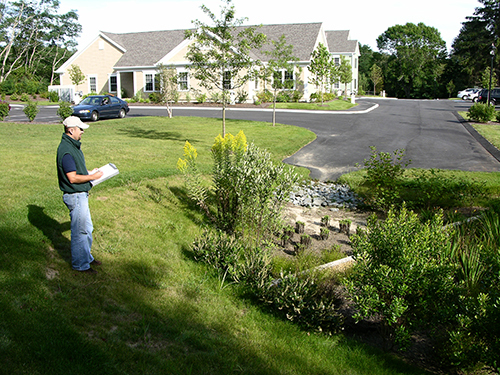 All Vegetated Stormwater Conveyance practices, including Dry Swale, Wet Swale, and Step Pool Conveyance will be reimbursed at 75% of total costs with a maximum payment of $10,000.00 per parcel per year. When pre-treatment is required, the pre-treatment costs are included in the cost of the practice. Stormwater Conveyances serve to prevent scour and erosion and provide water quality treatment while conveying stormwater. They are constructed trapezoidal channels lined with vegetation that inhibits erosion. From a water quality perspective, they are preferable to pipes because they allow more soil/water contact and more opportunity for infiltration. There are three types of vegetated conveyances: Dry Swales, Wet Swales, and Step Pool Conveyance Swales. Dry Swales are open vegetated channels or depressions explicitly designed to detain and promote filtration of stormwater runoff into an underlying fabricated soil matrix. Dry swales should have topsoil composed of loamy sands or silt loam. Silty clay loam or sandy clay are poorly suited for significant infiltration rates. The under drain system consists of a perforated pipe within a gravel layer on the bottom of the swale, beneath the filter media. Dry swales can be planted with turf grass, tall meadow grasses, decorative herbaceous cover, or trees. Wet Swales are shallow channels with check dams that create permanent pools that intercept groundwater and provide enhanced pollutant removal within the conveyance. 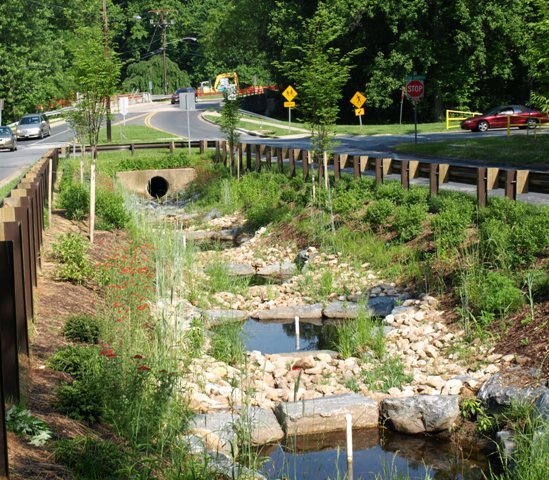 The goal of a wet swale is to create an elongated wetland treatment system that treats stormwater through physical and biological action. The saturated soil and wetland vegetation provide an ideal environment for gravitational settling, biological uptake, and microbial activity. 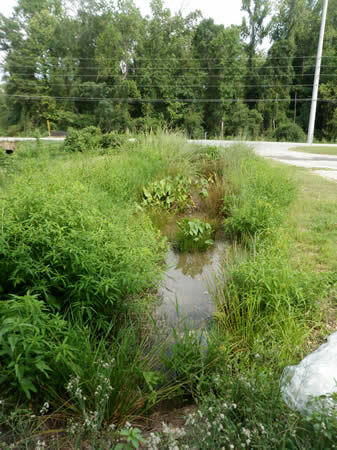 Unlike dry swales, infiltration of stormwater is an undesirable condition in a wet swale because it would likely result in conditions detrimental to maintaining saturated soils to support wetland vegetation. Step Pool Conveyance Swales utilize a series of constructed shallow aquatic pools, riffle grade control, native vegetation, and an underlying sand/woodchip mix filter bed media. SPCS can be designed to provide energy dissipation and extreme flood control, best suited to natural ravines with slopes of 10% or less.